There is no alternative to oats when it comes to having a healthy breakfast. The trick is however to prepare them in a delicious way, so that having a healthy diet does not seem to be a burden or some melodramatic sacrifice. You can check out an easy, delicious oats porridge recipe from one of my earlier posts. Now the present post is another oats porridge recipe where I have gone another step forward in the “health benefits scale”. The last post was gluten free, lactose free, low calorific version (70kcal per serving). In this version I have managed to even cut down on the calories and this porridge is also dairy free and thus vegan. To explain the basic difference, in this porridge I have replaced the lactose free milk by almond milk. To give an idea about calories, 100 ml of full cream milk has 68kcal, semi-skimmed milk has 47kcal and lactose free milk (that I used) has 43kcal. However milk made from almonds have 24kcal per 100ml thus making it way less calorific than all the types of milk available . This porridge thus is made purely from plant products and can be an option for my vegan friends. 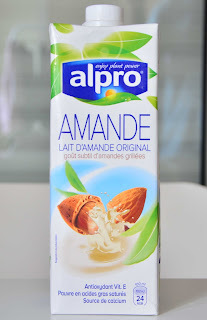 There is a slight difference is taste when using almond milk and opposed to animal milk and almond milk is much less creamy. But the nutty flavor of almond milk also adds a new dimension to the regular porridge. And finally the porridge has one of my favorite ingredients, chocolate. This makes it a healthy, delicious chocolaty delight that will not allow you to repent for those calorific, buttery breakfasts when on a healthy diet. Take the oats in a deep bottomed pan and add water to it. Turn the heat to medium. Add the sugar and salt and stir. When it starts to bubble add the cacao powder and stir nicely. Add the cinnamon powder and stir. Stir nicely in a circular motion. Add it to the porridge and stir till the banana is well mixed. The porridge is done when it has consistency like this. Remove from the heat, let it cool and then serve. You can use different garnishes. I used almonds as well as strawberries. A healthy porridge made with oats and cacao powder. A vegan, gluten free, dairy free, chocolaty delight with minimal calories. Add the almond milk and stir in a circular motion. Smash the banana and add it to the porridge. Stir till the banana is well mixed.